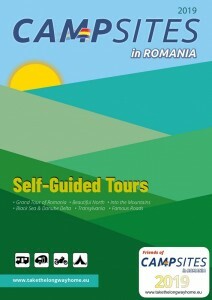 Campsites in Romania – Self Guided Tours 2019 is a mine of information covering the camping tourism field in Romania. Here you will find welcoming places situated in various tourist regions. From the mountains to the Black Sea shore, from the Danube Delta to the beautiful North, from the biggest camping to the simplest campsite located around a household, from the countryside to the crowded capital, a whole range of sites are to be found. This is Romania, a country packed with variety, offering the visitor a whole range of completly different sights and experiences. In the first part you will find a few objectives that we have selected, based on our experience of exposing at international touristic fairs and observing the main interest of foreign people about places in Romania. We have also included some places which we think they deserve paying a visit. Then, in the second part, we present the campsites that we recommend for spending the night in your journey. We have been at least one time in every campsite that is listed here. All the data that we provide about the campsites are collected directly from the manager of the location. Afterward you will find the routes that we advise you to take. Please do not use the indications as an exclusive source of guidance! Even if your GPS will find a much shorter road, please consider that we have been on these roads and that we chose the ones with reasonable quality. There are six tours. The biggest tour covers a big part of Romania, giving the possibility to see all the selected objectives; it can be made in about 30 days. On the other hand, the shortest tour can be made in about 10 days. Worry less, with your well informed travel companion!